A slice of pizza is a meal that many people look forward to on a regular basis, but eating the same style of pizza can get a bit boring. Instead of your usual pizza crust, you can try biscuit dough for a flaky texture and alternate flavor. Biscuit dough is as versatile as traditional pizza crust, so you can customize your pie with your preferred ingredients. Herbs and seasonings boost the flavor and complement any pizza toppings you choose. Spray the circular baking sheets with nonstick cooking spray. Open the canisters of biscuit dough and place in a medium-size bowl. Use your hands to knead the biscuit dough into two equal-size balls. 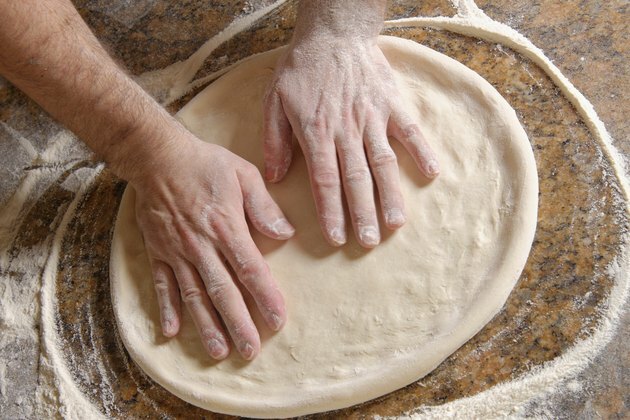 Spread the dough onto the circular baking sheets, using your fingers. Spray your fingers with nonstick cooking spray, if necessary. Brush the biscuit dough with olive oil using a basting brush. Sprinkle each pizza crust with dried oregano, dried basil and garlic powder. Bake the crusts for three to five minutes, or until just beginning to brown around the edges. Remove the pizza crusts from the oven and cool for three to four minutes. Spoon pizza sauce onto each crust and spread evenly. Sprinkle 1/2 cup of mozzarella cheese onto each crust. Top with your favorite ingredients, such as ham, bell peppers, black olives, onions, tomatoes or mushrooms. Return the pizzas to the oven and bake for five to seven minutes, or until the cheese has melted. Take the pizzas out of the oven and cool slightly. Cut into slices using a pizza cutter and transfer to plates using a spatula. Any variety of toppings can be used on a biscuit dough pizza crust. Try barbecue sauce and shredded chicken, or white sauce with spinach and cheese. Mashed beans with salsa, cheese, tomatoes and onions can make a healthy taco pizza. Use any flavor of cheese you prefer, such as Parmesan, cheddar or pepper jack. Do not overbake the crust the first time you put it in the oven. Cooking it for too long may lead to burning after you put the toppings on it.